Remember my article from Tuesday night about The Nowhere Men and the dark secret world of the football scouts? Well, here comes the litmus test. Just how good was my intel when it mattered when Dulwich Hamlet arrived at the Pan for today’s game. Firstly we should all raise our glasses to the immense work carried out by the Pitch Team (groundsmen sounds so web 2.0) who once again performed miracles in getting the game on. In fact, on Thursday it was almost as good as a goner, but then they found a machine in a locked cupboard at the ground which was basically a big sponge on wheels and used that to mop up the water. We needed to get today’s game on. Not only would the Dulwich fans be travelling in big numbers to see their table-topping side, but with only one game having been played at The Pan since Christmas, we could have really done with some gate receipts. Some Premier League fans may not realise that it’s not all Official Partnerships with fizzy drinks companies, or selling media rights to Uzbekistan in the Non-Leagues. We actually need paying fans through the gate on a regular basis so that we can do little things like pay players, utilities and maintain the ground. With no chance of any help from our dear leaders at the league, Lewes, like virtually every other club at our level (and below) have had to pray daily for an end to the rain. There was also the small matter of the leftovers from the Lewes Beer Festival that needed finishing off. 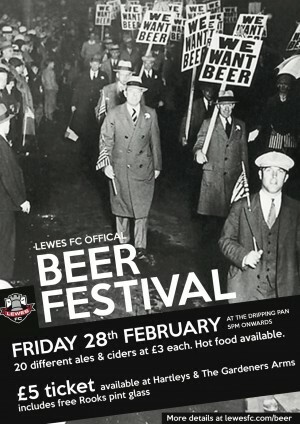 Not that football fans need an excuse to have a beer, especially as at The Dripping Pan you can have said beer whilst watching the game. Twenty guest ales, some of course exclusively provided by club sponsor and world-famous brewery, Harveys had been lined up for Friday night, and whilst the locals did serious damage to the volumes of beer, there would be some left over for today. Left over beer? No such thing. Just beer that hasn’t yet been enjoyed. So a perfect combination of football and beer was on the cards. And to celebrate the sun even decided to make an appearance. Terry had kindly pulled my lucky number out of the monthly Panning For Gold draw so I arrived at the ground £60 better off. Could the day get any better? Well if the Lewes side that traveled to Cray last Sunday made an appearance rather than the one that took the field at Grays on Thursday then this could be the best day ever. 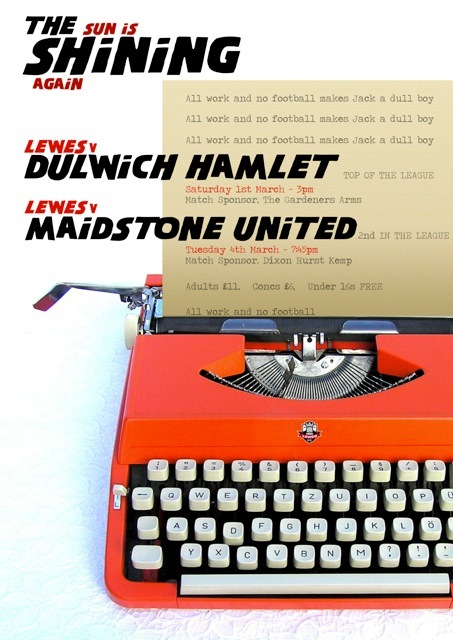 Lewes 2 Dulwich Hamlet 0 – The Dripping Pan – Saturday 1st March 2014 Sometimes you just want to bottle a feeling and smell it every day forever. 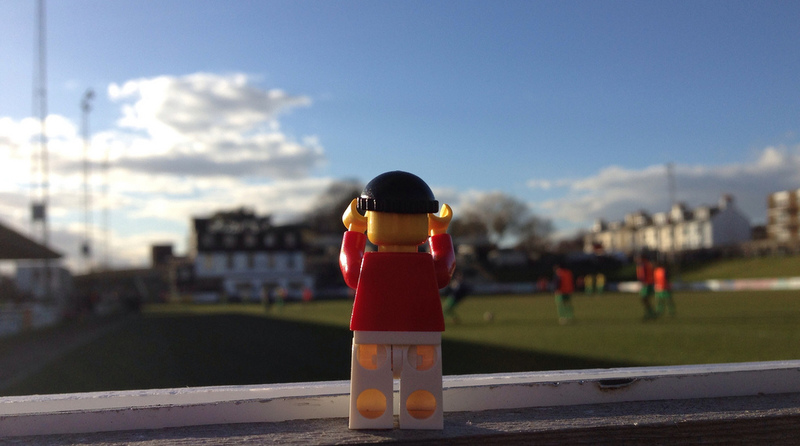 Not only did Lewes put on their finest performance of the season, nor did my scouting plan demonstrate the exact weaknesses that we exploited. It wasn’t just the fine beers that were still left over from the Beer festival or the £60 I had in my pocket from the Panning For Gold. It was a mixture of all of those elements plus the sun shining for the first time in months. Heck, Piers Morgan could have been standing next to me today and I would have probably shaken his hand at the end of the game. As we walked away from The Jungle at the end of the game we tried to decide who was our man of the match. And therein laid the beauty of the day. We couldn’t agree. We couldn’t agree because to a man, every player who took part could have been in with a shout. 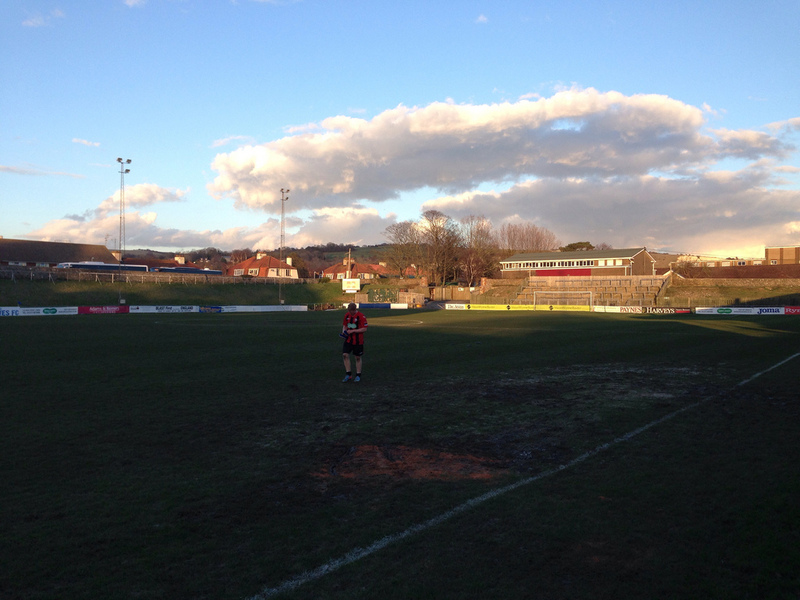 Football is a team game and that is how Lewes won. Team work makes the dream work, so they say and that is what happened today. We almost didn’t have a game at all. Despite the efforts of the pitch team it seemed that the perfect playing surface wasn’t good enough for the referee when he arrived at the ground at 1pm. He was “concerned” about a couple of areas of the pitch and ordered some sand. Do you know how difficult it is to find sand in Lewes, on a Saturday, at 1pm when you have a 15 minute deadline. Fortunately, Homebase had some sandpit sand that did the trick and we had a game. Lewes started brightly with the three central midfielders, Dixon, Walder and Logan pushed up the pitch to stop the dangerous Dulwich midfield having time on the ball. They weren’t hunting alone. Every time one of them got the ball, the three Rooks surrounded them, hassled them and unnerved them. Balls were played in behind the Dulwich full-backs thus stopping them getting forward. Pressure was put on Chico Ramos in the Dulwich goal when he had the ball as he didn’t like to kick the ball. All in the report lads. Best chance of the first half fell to Blewden who saw his header hit the post. Half-time and all square. But that changed in the first 90 seconds of the second half. Wheeler’s corner was caught by Ramos, who inexplicably dropped the ball over the line under no pressure at all. Of course we went easy on Ramos for the rest of the half especially when ten minutes later he could only parry a Blewden shot that slowly trickled towards the empty net only for Adeniyi to make it back to clear. If the referee was proving unpopular with the players, benches and fans alike due to some strange decisions (over ruling his linesmen on numerous occasions when they were better placed) then the build up to the Lewes second goal with ten to play saw him removed from the Dulwich Hamlet Manager’s Christmas card list forever. Dulwich’s right-back Boyer left the pitch as part of a substitution but his replacement wasn’t quite ready. The ball went out of play but instead of now allowing the replacement full-back on, he waved play on. Lewes broke, Brinkhurst ran through the empty space, rounded Ramos and slotted the ball home. The Dulwich manager was incensed and play was held up for six minutes whilst he argued with the officials despite being sent off. At one point the referee and linesman retreated a good 20 yards from the bench and we feared he was going to abandon the game. Finally we were back underway. That lasted 30 seconds before he saw another offence that no one else did and booked a player from each side whilst everyone was scratching their heads. The second goal gave us some comfort as we played out the six minutes of injury time. Full time, job done. One final word on the afternoon. Dulwich Hamlet’s fans came in numbers (about 150), saw their team underperform, but conquered with their non-stop singing and assisting in finishing the last barrels of beer from the Beer festival. So in many ways, they were winners to. Hats of chaps and the best of luck for the rest of the season.